On the south bank the Rhodesian Government announced a review of land tenure at the Victoria Falls, resulting in new areas being opened up for development. 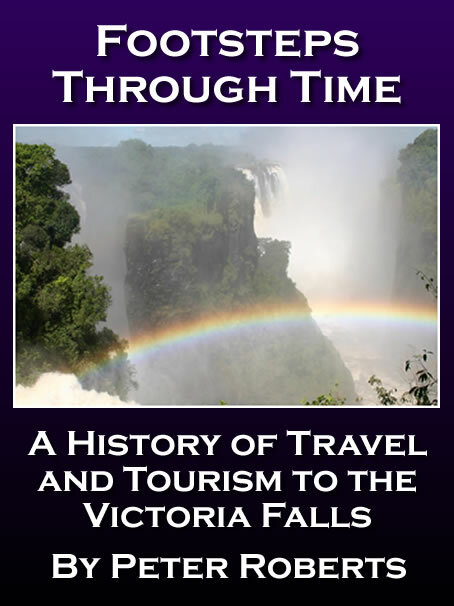 Land use policy up to this date had effectively restricted development and protected the natural environment of the Victoria Falls, but the changing geopolitical landscape made further infrastructure development inevitable. 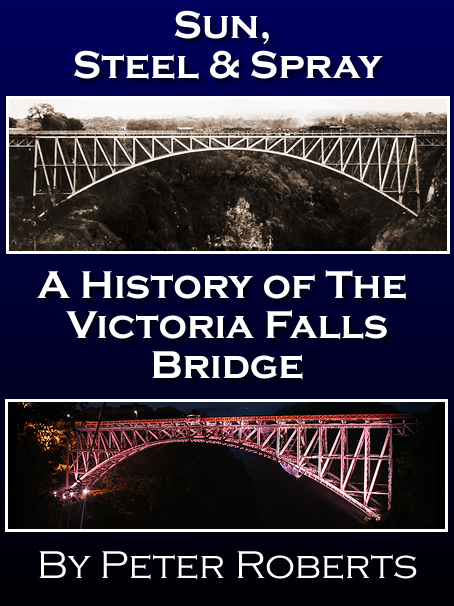 Victoria Falls town expanded rapidly during this period with the development of business stands and residential suburbs. 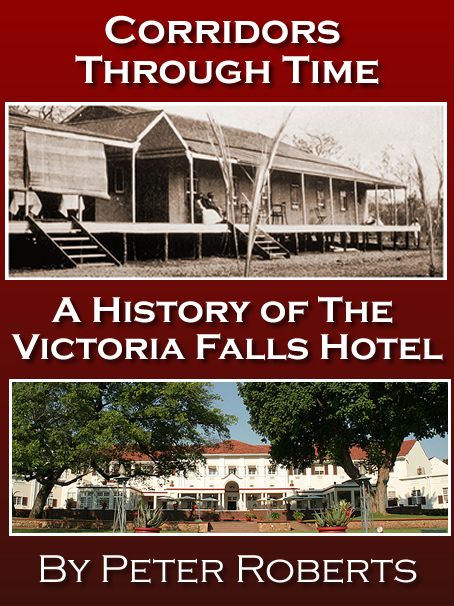 In late 1965 Livingstone based businessman Harry Sossen approached the Falls Hotel for support in a bid to buy or acquire a revised long term lease for the Victoria Falls Garage, which he had operated for some decades since the death of Ted Spencer. Located on the turning to the approach road of the Falls Hotel, he hoped to expand his trade by negotiating around a lease clause which prevented him from operating a tourism agency. Being part of the Railway Reserve, however, the land was deliberately leased on a short term basis (five years) with restrictions on ‘taking bookings for, undertaking or arranging any excursions, boat trips or the like’ specifically to protect the interests of the Hotel. 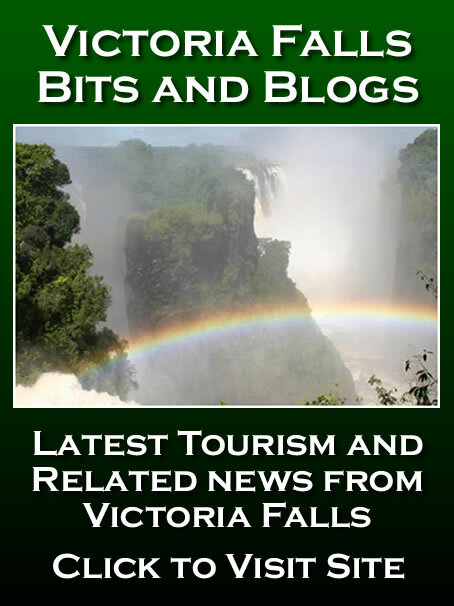 Growing tourism demands, however, eventually saw the construction of the Victoria Falls Casino, later known as the Makasa Sun Hotel, in 1966 on the site immediately next to the Victoria Falls Hotel. The casino was the first in the country and an added attraction advertised even by the Falls Hotel itself. The Casino was extended in 1969 with the addition of a new wing comprising 54 bedrooms and three luxury suites, at a cost of £175,000, and by 1979 the Hotel boasted four luxury suites and 102 bedrooms all with private bathroom, shower, radio and telephone. Controversially the development broke the local skyline of the Falls, infringing a local council building requirement that no construction should be built above the tree-line, and so be visible from the river and Falls. A small section of the old trolley line down to the Falls was preserved in the grounds of the Hotel. The Victoria Falls Airport was opened in 1967, allowing the growing town to service its own aviation arrivals and departures and avoiding the extra rigmarole of Zambian customs and immigration formalities. The new airport was built at some distance, 20 kilometres, from the Victoria Falls and the growing tourism town. The development of the Air Rhodesia Victoria Falls, Kariba and Hwange National Park domestic air routes boosted regional tourism. 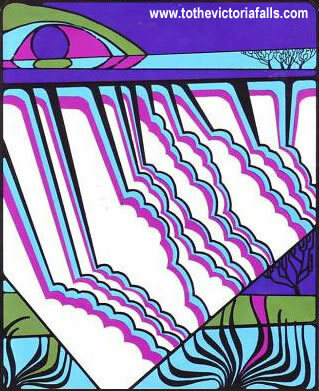 Despite all the new developments at the Falls, a late 1960s tourism information leaflet, produced by the Rhodesian National Tourism Board, still proudly presented the Falls as untouched by man and modern development. The town now boasted a modern Post Office and banks, including the distinctive Standard Bank building, opened in 1968. New tourist attractions included the Falls Craft Village (established in 1967), Snake Park and Curio Markets selling traditional carvings and tourism souvenirs. The Falls Hotel saw another record year in 1967 with close to 22,000 visitors. The record numbers were largely due to the growth of regional air travel, and success of Air Rhodesia’s Flame Lilly holiday packages. Cocktails at The Victoria Falls Hotel. Scenic flights from the Sprayview Aerodrome offered by Rhodesian United Air Carriers now included two hour and 200 mile (321 km) flying safaris. Flights could be booked from the reception counter at the Falls Hotel. The reconstruction of the main Bulawayo to Victoria Falls strip road as a fully-tarred highway began in 1963 and took several years. The new road largely followed the route of the old strip road, although re-aligned to a more direct route in places. Despite being located within the core Special Area of the Falls, government ministers supported the development which was subsequently passed to parliament for approval. In a separate proposal put forward in the same year the Railway Company applied for 4.5 acres of land to develop a tourist recreational facility including chip-and-putt golf course, bowling greens, tennis courts, a discotheque, a refreshments bar, and an amusement centre for children. These and other development pressures resulted in the decision to reduce to size of the Special Area to concentrate protection on the core area around the Falls. The population of Livingstone was recorded at 49,063 in the census of 1969. In 1969 improvements were made to the tourism infrastructure on the northern bank with the construction of the Knife-Edge Bridge. The footbridge opened up access to views of the Falls which tourists had previously struggled to reach, resulting in many minor injuries over the years. On 1st February 1970 operation of the Falls Hotel was leased by the Rhodesia Railways to external management, marking the end of over fifty years of direct management by the Railway Company. Through its new managers, Rhodesian Breweries (Rhobrew), the Hotel was operated under the umbrella of the Southern Sun Hotel Corporation of Rhodesia Limited, known as Southern Sun, and part of a portfolio of hotels across the country - resulting in significant operational benefits and publicity opportunities, especially in the South African market. The group also had plans for a modern new hotel complex on the southern bank, which would result in the development of the Elephant Hills Country Club, opened in 1974. The early seventies saw a period of rapid growth in the development of the town, with the construction of new infrastructure and tourism facilities, including housing suburbs, commercial centres, industrial premises, office and staff accommodation blocks and a diversification of new hotels. Local construction company Gardini & Sons, under the skilled guidance of Carlo Gardini, were responsible for a large percentage of the construction projects (including the previously built Casino and soon to be built Elephant Hills), with Carlo becoming known as ‘the man who built Victoria Falls’ (Meadows, 2000). 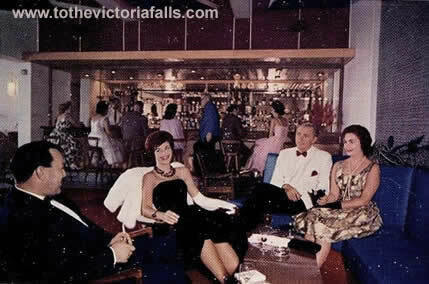 The 40-room, fully air-conditioned, Peter’s Motel opened in 1969, later renamed the Victoria Falls Motel (and later still the Sprayview Hotel), was built, owned and operated by the Gardini family. The riverside A’Zambezi River Lodge, with 65 double and 15 family rooms, opened in 1972, and the centrally located 44-room Rainbow Hotel in 1974 - both again constructed by Gardini & Sons. The Spencer Creek Crocodile Ranch was established in 1971, operating as both a commercial crocodile farm and tourist attraction. The ranch has grown into a major employer in the predominantly tourism based town. The old Sprayview Restaurant was demolished in 1970. 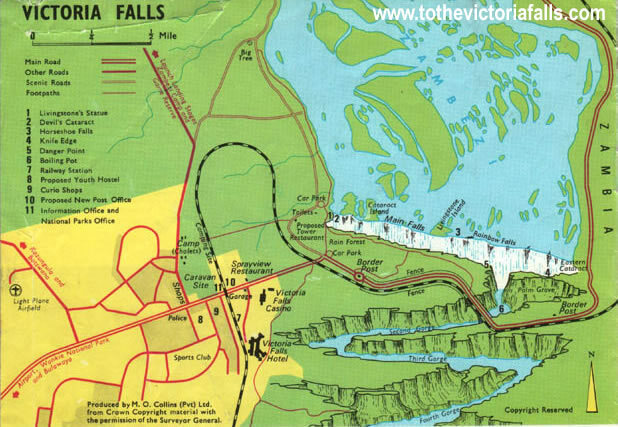 By 1969 the population of Victoria Falls town had grown to 3,450 (CSO, 1969). National annual tourism arrivals reached 270,000 in 1970, up from 250,000 the previous year. Arrivals peaked at 360,000 in 1972. In 1972 the town management board was upgraded into a Town Council. 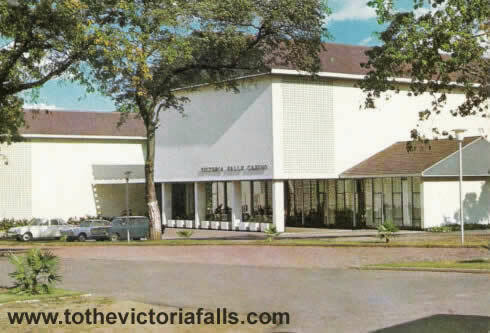 The Victoria Falls Main Camp accommodation, camping and caravanning facilities located in the town centre were taken over by the Town Council in 1974. By the mid seventies new visitor pathways had been developed running through the Rainforest and to the various viewpoints on the south bank. Dr William W Cowen, railway medical officer at the Falls during the 1950s, recalls returning after a long absence of many years, recording mixed feelings over the many new developments and changes in the town and surroundings. On the north bank the Victoria Falls Trust was dissolved and the Zoological Game Park redesignated as the expanded Mosi-oa-Tunya National Park on 25th February 1972, managed by the National Parks and Wildlife Services - now the Zambia Wildlife Authority (ZAWA). The Natural Heritage Commission (now the National Heritage Conservation Commission) continued to manage the Falls and historic cultural sites within the National Park, including the Old Drift settlement. CSO (1989) 1982 Population: Main Demographic Features of the Population of Matabeland North Province, Central Statistics Office, Harare.